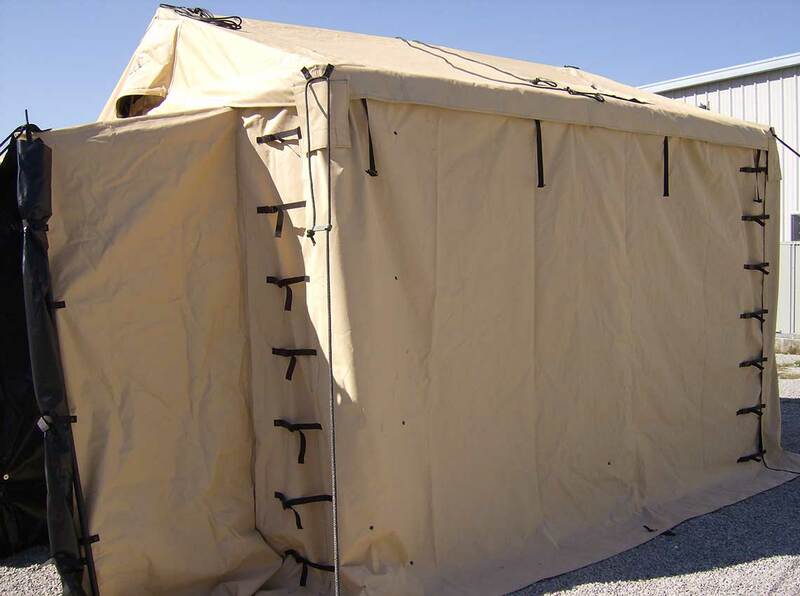 The Modular command post Tent (MCP), is a modular aluminum frame supported soft-walled shelter tent made of polyester duck fabric. 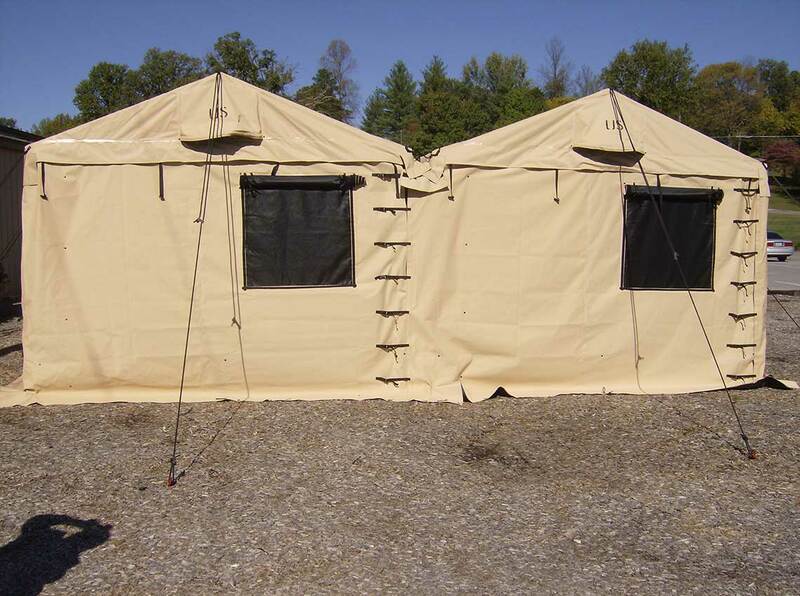 The MCP, a highly mobile, rapidly deployable, and extensive tent system, can be set up and configured to meet multiple applications. The design of the MCP is based on self contained modules that can be extended and used for various special purposes. Originally designed specifically for field command center operations, the Modular Command Post's versatility and functionality provides for a variety of operational uses. The modular command post's design flexibility will accommodate small units or large numbers of people in large command operations. The MCP can be employed in numerous environments including existing structures, emergency vehicles and field placement. The Modular Command Post can be employed with the Emergency Response Delivery System. The trailer platform provides a delivery system for First Responders and can be outfitted with various options to meet the needs of the user. The base platform includes a Modular Command Post shelter, 6 KW Generator, Light Set, ECU package and Trailer. Other options can be added to customize this ERDS to the intended use. The MCP design is based on command post systems as single, self-contained entities, or facilities. Each facility is capable of independent operations or may be complexed together to form larger scale command units. Applications for the MCP include military command and control applications, Border Patrol and U.S. Customs command centers, Homeland Security / defense applications, emergency response operation centers, mobile police command posts, mobile air traffic control centers, civil-military operations and security monitoring centers. The Modular Command Post is available with or without a table, map and light set. Modular - The modular MCP enables the creation of self-contained units that are capable of either standalone operations or can be connected to other modules for joint operations. Extendible - The MCP is designed to facilitate the incorporation of new capabilities and technologies with minimal disruption of the operations or functionality. Mobile - The MCP is highly mobile and rapidly deployable. The components are lightweight, durable and require minimal logistics. The components can be packed and relocated quickly enabling some level of situational awareness while on the move. The setup and takedown times are designed to accommodate faced paced tactical environments. The Modular Command Post is designed to be erected by 2 men in 20 minutes. The floor area is 121 sq. ft.
Scalable - The MCP structures can be interconnected to meet a variety of unit applications.